In a colander, toss the cucumbers with 1 teaspoon of salt. Let stand for 15 minutes, then gently squeeze out the excess water. In a large bowl, mix the cucumbers with the chopped dill and 1/4 cup of the yogurt and season with salt and pepper. Meanwhile, put the breadcrumbs and the remaining 1 1/2 cups of yogurt in 2 separate shallow bowls. Season the pork with salt and pepper and dip in the yogurt, letting the excess drip back into the bowl. Dredge in the breadcrumbs, pressing to flatten the pork and help the crumbs adhere. In a large skillet, heat 1/4 inch of oil until shimmering. In batches, add the pork in a single layer and cook over moderately high heat, turning once, until browned and crispy, about 5 minutes. Transfer to paper towels to drain. 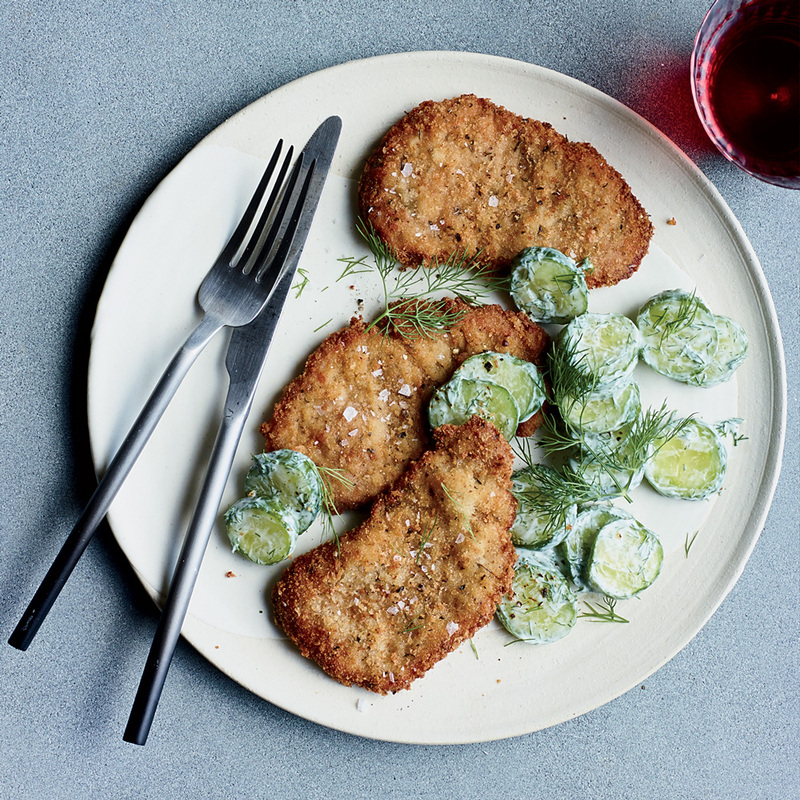 Serve the pork with the cucumber salad and garnish with small sprigs of dill.